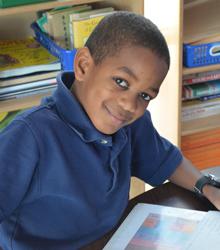 Trinity Episcopal School: Why K-8? 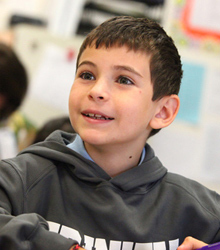 Why Choose a K-8 School? The K-8 model offers a great balance. It gives lower schoolers a very nurturing learning environment, and it challenges middle schoolers to develop as leaders and role models. A 2016 study published in the American Educational Research Journal found that 6-8 graders were better off academically, socially, and emotionally in K-8 schools compared to 6-8 or 6-12 schools. One of our favorite traditions is the K8 Buddy program because it exemplifies the K-8 experience. Each kindergartner is matched with an 8th grader, and the pairs enjoy playdates and learning activities throughout the year. Many 8th graders keep in touch with their kindergarten buddies even after they have graduated Trinity. With strong leadship skills at a relatively young age, our eighth grade students appeal to a wide variety of high schools. Through our High School Placement program, we partner with every student to find their ideal fit for the next level. Trinity students matriculate into the finest institutions in Austin as well as day and boarding schools around the country. Still not convinced? Here's eight reasons why we believe in the K-8 model. 1. By eighth grade, you know your child as a learner. In the elementary and middle years, your student’s academic strengths, interests, learning styles, and gifts become defined. These individual characteristics become apparent during pre-adolescence. There are excellent high school choices – each with their own strengths and areas of focus. By the time your child is in eighth grade, the best “match” for high school is easy to determine. 2. As an eighth grader, your child is involved in choosing the high school. During the early childhood years, you, as parents, make the school decisions. A family choice, involving your eighth grader with the support of the school, is a satisfying and personalized way to choose a high school. In turn, this experience better prepares students for making college choices. 3. Ninth grade is a natural transition point. Keeping children in a consistent and familial educational environment through the elementary and middle years is ideal, before allowing them the freedom of a change of venue, new friends and new challenges for high school. 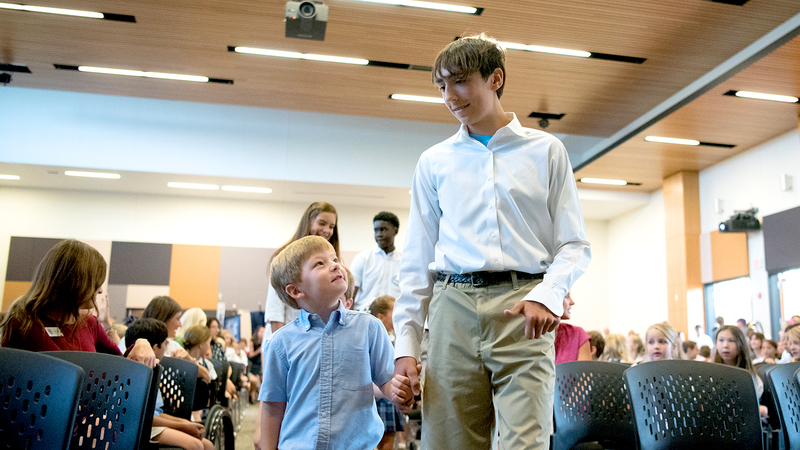 Because Trinity ends in eighth grade, all of our graduates leave together offering support to one another. At ninth grade, students are eager to experience new friendships and challenges that support their individual interests before college. 4. In any school, programs for the oldest students are always the most expensive. In terms of complexity, faculty, and facilities, schools funnel the most financial resources and attention to the highest grades they serve. 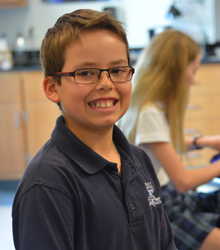 At Trinity, that is middle school, a time when students are discovering their learning style and passions. 5. Children don’t grow up too fast. 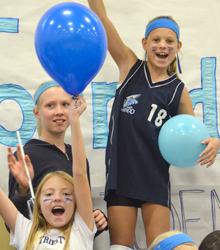 Trinity's elementary and middle school environment allows students to experience age appropriate activities and events, without the influence and pressure of older students. Seventh and eighth graders are not “caught in the middle” but take on the role of "seniors.” At the same time they can be themselves, often remaining “younger” a bit longer. 6. Your child has early leadership and activity opportunities. The oldest students on any campus assume the mantle of leadership and act as role models for the entire student body. Our middle school students rise to the challenge and serve on the Student Council, have the starring roles in school musicals, and play on Trinity’s highest-level athletic teams. 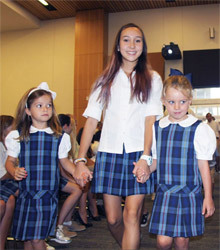 The positive achievements of early adolescents are recognized as culminating events and traditions at Trinity. Enjoying that privilege in seventh and eighth grade better prepares students for those same opportunities in high school and beyond. 7. Choosing a high school is a team effort between your family and Trinity. 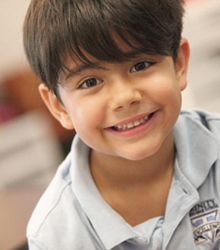 The Middle School Head, Admission Director, and High School Placement Coordinator work in partnership with you and your student to find a high school “match” that honors your child’s unique gifts and achievements. Trinity's placement team knows the schools and knows your student. Trinity students are sought after as high school freshman because they are well-prepared,self-assured, and well-rounded. 8. The “Trinity Connection” lasts a lifetime. 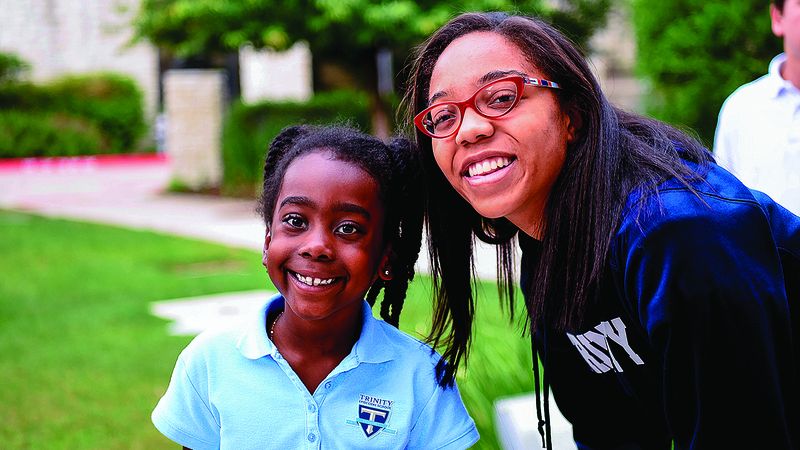 Students experiencing Trinity throughout the elementary and middle school years have values and friendships that will define them throughout their lives.